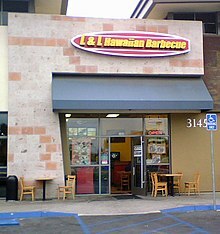 L&L Hawaiian Barbecue, or simply L&L and known as L&L Drive-Inn in Hawaii, is a Hawaiian-themed franchise restaurant chain based in Honolulu, Hawaii, centered on the Hawaiian plate lunch (Hawaiian: pā mea ʻai). Johnson Kam and Eddie Flores, Jr., purchased the original L&L Drive-In in 1976. The company expanded from its original base of Hawaii in 1999 into Californian markets. There are approximately 200 locations in Alaska, Arizona, Colorado, Nevada, New York, Oregon, Tennessee, Texas, Florida, Utah, Washington, and Guam. Outside the United States, the company also has locations in New Zealand, Japan, the Philippines, Malaysia, and Indonesia. In 1976, Eddie Flores bought a small building that formerly housed a retail outlet for L&L Dairy on Honolulu's Liliha Street. He kept the L&L part of the name and remodeled the building as a small walk-up restaurant for his mother to operate. This business was the first location of the growing L&L Drive-Inn chain that specialized in the plate lunch. After this single building business became a success, Johnson Kam joined Flores in the expanding the business to other locations within the state of Hawaii. To help in the expansion, Flores and Kam began to offer franchises, mostly to successful employees, in 1988 By 1997, there were 30 locations through Hawaii. In early June 1999, Flores noticed that a former employee was doing fairly well selling Hawaiian-style plate lunches in the San Francisco area despite the fact the restaurant was not in an ideal location. Since he realize that it was possible to sell Hawaiian-style plate lunches in California, Flores obtained a location inside the Puente Hills Mall in the City of Industry, California to open the first L&L location on mainland just a few months later in October. Since Californians had different expectations on the type of foods that are usually served at an eating establishment that are called "drive-ins" (i.e., restaurants with carhop service like the Bob's Big Boy restaurant in Burbank, California that sells burgers and fries) to that which most Hawaiians would expect to receive at an L&L Drive-Inn on the islands, Flores decided to change the name of the L&L locations on the mainland to L&L Hawaiian Barbecue to strengthen the chain's association to Hawaiian cuisine. At the time of the opening of the first location in the state of California in October 1999, there were 49 L&L locations in Hawaii. After opening at the Puente Hills Mall, chain open other locations through Los Angeles County. In September 2000, L&L opened its first location in Orange County. The first L&L location in the state of Oregon was opened in Hillsboro in August 2001. The first L&L location in the state of Nevada was opened in Henderson in July 2002. The first L&L location in the state of Washington was opened in Lynnwood in March 2003. The first L&L location in the state of Arizona was opened in Mesa in June 2004. The first L&L location in the state of Utah was opened in Provo in August 2004. The first L&L location in the state of Colorado was opened in Aurora in August 2004. The first L&L location in the state of Texas was opened in Lewisville in April 2008. Moving east of the Rockies, the first L&L location on the East Coast and in the state of Connecticut was opened in Manchester in May 2003. This location never did very well and the company quickly withdrew from this state. Advancing into the state of New York, the first L&L location was opened on Fulton Street in New York City in November 2004. After struggling a bit in an extremely high rent location, the New York City location had closed by mid-2013. The only L&L location that has appeared to have survived in the state of New York is located near the Canadian border at Evans Mills. The first L&L location in the state of Florida was opened in Jacksonville in April 2017. The first L&L location in the Midwest and in the state of Illinois was opened in Champaign near the campus of the University of Illinois at Urbana–Champaign in October 2004. This location never did very well and the company quickly withdrew from this state. The first L&L location in the state of Michigan was opened in East Lansing in June 2005. Although this restaurant was located near the campus of Michigan State University, this Midwestern location never did very well and the company quickly withdrew from this state. The first L&L location in the state of Tennessee was opened in Franklin in June 2015. At the time of the opening in Franklin, that location was the only location between Texas and New York. The first expansion move to the west of Hawaii occurred when the first L&L location in the territory of American Samoa was opened in June 2008. The franchise had closed sometime between September 2012 and March 2013. Later, the first L&L location in the territory of Guam was opened in October 2014. The first location outside the United States was opened in Otahuhu in New Zealand in February 2009. In Japan, the first location was opened in the Shibuya section of Tokyo in June 2010, and the second location near Enoshima, Fujisawa, Kanagawa, in December 2017. In China, the first location was opened in June 2013. As of late 2016, no definite evidence of any current location in China was found. Moving into Maritime Southeast Asia, the first L&L location in Malaysia was opened in Kuala Lumpur in December 2014. In 2015, the first L&L location in Indonesia was opened in Jakarta in June 2015, followed by the first L&L location in the Philippines which opened in Manila in October 2015. ^ Staton, Ron (2004-08-21). "100th L&L opens in California". Honolulu Advertiser. ^ Hua, Vanessa (2003-07-03). "BAY AREA / More venues offer diners a taste of Hawaii, close by / Diverse population drawn to food that's similar to homeland's". San Francisco Chronicle. p. B-1. Retrieved 2007-04-21. ^ Staton, Ron (June 12, 2005). "L&L had small, slow start but it's moving fast now". Honolulu Star-Bulletin. "We have restaurants in Arizona, Colorado and Utah, and all three are doing very well -- in fact, better than California," Flores said. "The reason is a lack of competition. The stores are jam-packed." L&L's first outpost in Michigan opened in January in East Lansing. There are also L&Ls in Nevada, Washington, Illinois and New York, where the first L&L opened on Fulton Street in Manhattan in November and another opened near 34th Street in January. ^ Wilson, Christie (August 2010). "Growing by Going Global: 5 success stories prove that small, local companies can flourish nationally and internationally". Hawaii Business Magazine. ^ Enomoto, Catherine Kekoa (July 16, 1997). "Lots of chicken take lemon dip". Honolulu Star-Bulletin. ^ a b Lynch, Russ (November 26, 1999). "L&L Drive-Inn restaurateur seeking mainland meal ticket: The owner of the local-style food chain wants to capitalize on his success in the isles". Honolulu Star-Bulletin. ^ Nakaso, Dan (August 9, 2005). "Plate lunches conquer Mainland". Honolulu Advertiser. ^ Barayuga, Debra (September 29, 2002). "L&L partners eye international growth: The plate lunch chain plans more locations on the mainland and Guam and in Japan". Honolulu Star-Bulletin. all 47 locations here and on the mainland... 12 L&L Hawaiian Barbecues in California, Oregon and the one that opened July 17 in Las Vegas at the Whitney Ranch Center in Henderson. ^ Corcoran, Penelope (March 5, 2003). "New Spots Satisfy Hankering for Hawaiian". Seattle Post-Intelligencer. p. D1. (Subscription required (help)). Lynnwood is the lucky locale to be honored with the very first Washington branch of L&L Hawaiian Barbecue, a popular Honolulu-based chain. Cite uses deprecated parameter |subscription= (help). ^ "L&L Hawaiian Barbecue is now open in Provo". Deseret News. August 4, 2004. ^ Eakin, Dan (April 1, 2008). "L&L Hawaiian Barbecue opens with dancers, band, priest". Lewisville Leader. ^ Niva, Josh (March 26, 2010). "Taste of Hawaii". Alaska Dispatch News. L&L Hawaiian Barbecue sprang up in the Dimond mall in November... L&L is a national chain bringing Hawaiian, Polynesian and Pacific Rim standards to mainland America food courts since 1988. Its first Alaska location is in the Dimond Center's basement food court, next to the ice rink... L&L's menu is surprisingly broad, covering fish, beef, pork and even Spam. There are even lighter options like salad and brown rice. ^ Engle, Erika (November 19, 2009). "Board shorts feature iconic L&L plate lunches". Honolulu Star-Bulletin. L&L Drive-Inn and Hawaiian Island Creations will debut co-branded board shorts, bearing images of the favored local dishes and the L&L logo... The plate-lunch board shorts come with a hang-tag that, when mailed to L&L with proof of purchase, will net the sender a $5 gift certificate good toward a food purchase. For expats, the togs will be sold online via the L&L Web site... Meanwhile, the first L&L Hawaiian Barbecue will be opening in Alaska after the Thanksgiving holiday. ^ Sax, Irene (December 11, 2004). "Wikki Wakki 'Cue". New York Daily News. ^ Dziemianowicz, Joe (March 16, 2005). "Spam Takes the Stage. Monty Python's musical puts the spotlight on a Hawaiian staple". New York Daily News. My quest brought me to 64 Fulton St., where an outpost of L&L Hawaiian Barbecue opened in November. ^ "Lebanese Standby Replaces Hawaiian Plate Lunches On Fulton". Midtown Lunch. September 23, 2013. ^ Siebel, Walter (December 9, 2012). "A taste of the Aloha State in Evans Mills". Watertown Daily Times. ^ Mathis, Karen Brune (January 24, 2017). "L&L Hawaiian Barbecue joining North Florida market". Jacksonville Daily Record. ^ "L&L Hawaiian Barbecue Grand Opening ad". Lansing State Journal. June 23, 2005. p. 46. ^ Moriki, Darin (May 1, 2015). "L&L Hawaiian Grill to follow Hawaii native Marcus Mariota to Nashville". Pacific Business News. ^ "Popular Hawaii Restaurant Opens In American Samoa". Pacific Islands Report. June 24, 2008. ^ "Welcome to L&L Hawaiian Barbecue of American Samoa". L&L Hawaiian Barbecue of American Samoa. Archived from the original on 2012-09-22. ^ "We regret that L&L Hawaiian Barbecue in Pago Pago is now closed". L&L Hawaiian Barbecue of American Samoa. Archived from the original on 2013-03-26. 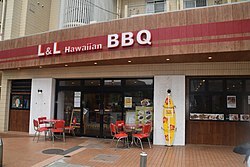 ^ a b "L & L Hawaiian Barbecue to open four new restaurants in Guam, Malaysia". Pacific Business News. September 29, 2014. ^ "L&L plate lunchery says aloha to Aotearoa". Honolulu Star-Bulletin. February 19, 2009. ^ Engle, Erika (June 7, 2010). "L&L opens its first store in Japan in busy Shibuya". Honolulu Star-Advertiser. ^ "L&L Opens Tokyo Restaurant". KITV. June 7, 2010. Archived from the original on 2012-02-23. Retrieved 2010-06-07. ^ "L&L opens first restaurant in China". KHON-TV. June 20, 2013. ^ Perdani, Yuliasri (July 3, 2015). "A tour of sizzling: mouth-watering barbecues". Jakarta Post. ^ Moriki, Darin (October 2, 2015). "L&L Hawaiian Barbecue opens first restaurant in the Philippines". Pacific Business News. ^ a b c d "About L&L". L&L Hawaiian Barbecue. Retrieved 22 April 2015. This page was last edited on 7 March 2019, at 21:59 (UTC).